A building at left on the corner of Fifth Avenue and Neville Street (this building still exists) and Rodef Shalom behind that are easily recognizable in this view of Shadyside taken on July 25, 1918. Image courtesy of Historic Pittsburgh, the Digital Research Library at the University of Pittsburgh. A photographer took the image above on July 25, 1918 while standing in the middle of Fifth Avenue, looking toward Shadyside from what is now Oakland. Today the Shadyside community comes up to Neville Street, which crosses Fifth Avenue in the foreground from behind the sign with the Coca-Cola ad at left to behind the automobile at right, and the Oakland community is on the other side of Neville. 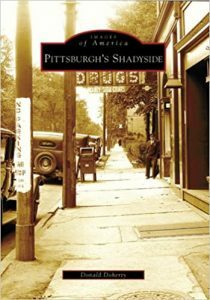 During the late 1910s Shadyside was transforming from a railroad suburb into a city neighborhood. 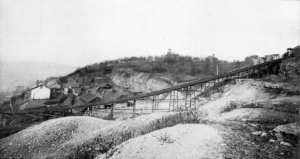 Shadyside was established in the middle of farmland during the late 1860s, when the Shady Side Train Station opened at the end of Amberson Avenue next to the Pennsylvania Railroad tracks. Around 1918 automobiles were increasingly prevalent and the city of Pittsburgh built up around Shadyside. In the image above you can see the various kinds of transportation on Fifth Avenue (click the image to get a closer view). In the foreground at right is an automobile. Further back at left is a horse, and in the distance is a trolley. Notice the trees standing between the sidewalks and the street along Fifth Avenue. Today it would vastly improve our Fifth Avenue walking experience to bring back this buffer between roadway and walkway! This entry was posted in Shadyside History on June 12, 2017 by don.